Monument Visa Service is a family owned company that authenticates hundreds of documents every year that are destined to be used in China. China is a non-apostille country and any document that will be used in China must first be legalized by the Chinese Consulate. Document legalization is a multi-level, multi-step process. We can legalize documents from all 50 States through the Washington DC Consulate. Undertaking this process alone can very frustrating and time consuming. At Monument Visa Service we take great care in processing your documents. Making the entire process, fast, efficient, and effortless. Legalizing documents for China can be a complicated process. Don't leave this process to untrained professionals who do not completely understand the China authentication process. You documents could be rejected costing you time and money. We Authenticate hundreds of documents every month for clients that plan to work or conduct business in China. Contact us today and we will walk you through the entire process. Planning on working in China? For those who are planning on working in China you will be required to have your college diploma, background check, and possibly a TEFL certificate legalized. In almost all cases you can email us scans of these documents to be legalized. We can complete the entire legalization process for you with scans of these documents. FBI background checks can only be emailed to us if you received a digital copy(pdf) directly from the FBI channeler. Diplomas, State & Local Background checks, and TEFL certificates can be emailed to us. Below are the steps and processing times to be completed by us, in order to have your documents legalized for use in China. Once legalized, we will email you a scan of each document before shipping. You can forward these scans to your employer to begin your work permit application. TOTAL PROCESSING TIME IS 9 BUSINESS DAYS. 1. Scans of your Diploma, Background Check and TEFL/CETL Certificate (if required). FBI CRC Can only be emailed if you received a digital copy(pdf) directly from the channeler. 3. Completed China Legalization Application- Type in all caps. Complete as much as you can. We will correct any missing or incorrect information for you. 4. Completed Online Order Form: This can be emailed as well. Our Fee is $150.00 per document. This includes all notary, government, and embassy fees. When orders are received you will receive a confirmation email. At Monument Visa service, we take great care in processing your documents. We will keep you updated throughout the legalization process. 1. Your original passport mailed to our office. Must have 12 months or more of validity left. 2. 1 Passport Photo. 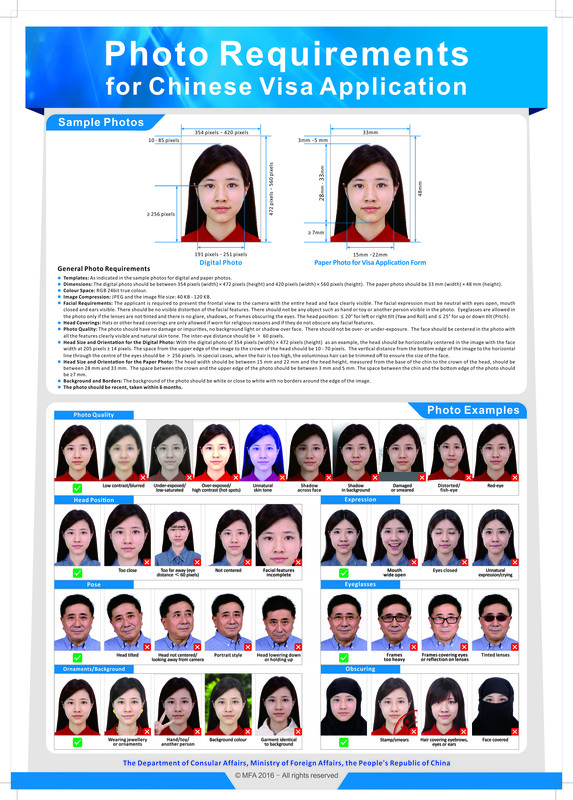 The Chinese Consulate has very strict photo requirements: Make sure the photo is taken with a WHITE background. Please remove glasses, no smiling, and hair pulled behind ears. You can find a detailed list of requirements HERE. 5. Completed Chinese Visa Application: Type in all CAPS. Type N/A in fields that are not applicable. Complete as much as you can. When complete please save the application and email it to kevin@monumentvisa.com for review.